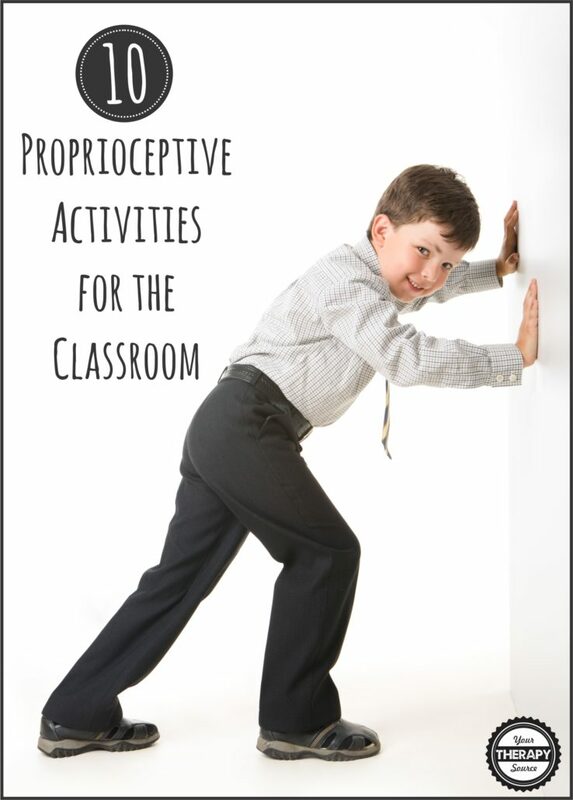 As pediatric therapists, we all know how beneficial proprioceptive activities are for children. These heavy work exercises help provide students with sensory information about body awareness and positions. They help to calm and regulate a student. Proprioceptive activities can also help to wake up the muscles getting our bodies in an alert state to be ready to learn. Chair Push Ups: Sitting with upright posture in a classroom chair, the child put his/her hands on the side of the seat. The child lifts and holds his/her bottom up off the seat for 3-5 seconds and then slowly lowers back down into the chair. Wall Push Ups: Put both hands on the wall with the feet a little farther than arm’s length back from the wall. Lean your body towards the wall and back out. Another option is to just push both hands against the wall for 5-10 seconds with arms extended. Desk Push Ups: Place both forearms on the desk, palms facing down and flat. Lean your body weight over your forearms lifting your bottom off the chair. Return to a seated position. Repeat several times. Bear Hugs: Wrap your arms around your chest or knees and give yourself a big, firm hug. Carry Heavy Books: Give the child a job to organize or hand out heavy books. Wash the desks or boards: The child can apply pressure when wiping the desks. Stack or unstack classroom chairs: Classroom chairs are heavy therefore this is “heavy work”. Use a hand held pencil sharpener: The act of holding and turning the pencil with one hand and holding the pencil sharpener tight with the other hand provides proprioceptive input the hands and fingers. Jumping in place: Jumping in place, jumping jacks or marching in place helps to wake up the leg muscles and provide sensory input. This is a great activity to do before activities that require body awareness such as sitting during circle time and walking in a classroom line. You could create a proprioception station in the classroom. Students could perform heavy work activities prior to school work. 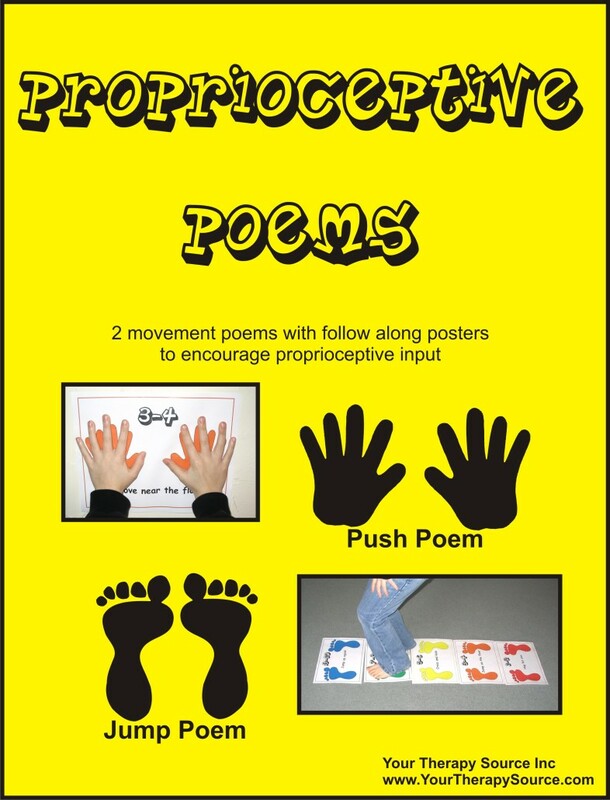 Proprioceptive Poems can help jump start that station into action. This digital document includes the Push Poem and Jump Poem. The poems encourage proprioceptive input with visual cues for the child to follow. Each poem comes with 5 pictures for visual cues along with a poster. The sing song text of the poem is easy for the child to remember. This is a great starter activity prior to table top tasks, fine motor skills and tactile input. FIND OUT MORE INFORMATION. Read more about proprioception and handwriting.